The Marine Room restaurant at The La Jolla Beach and Tennis Club in La Jolla, California, kisses the shore of the Pacific Ocean to offer exquisite views, unsurpassed with a setting sun, along with exceptional fine dining in a romantic, elegant atmosphere. During high tide, with the waves crashing upon the huge picture windows, the turf not only meets the surf, but the restaurant appears to be a vessel anchored amongst the breakers. It is truly a spectacular experience. 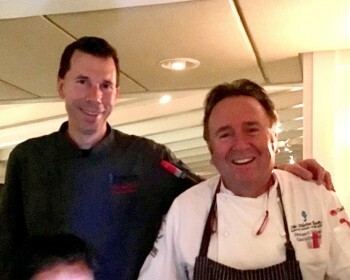 Executive Chef Bernard Guillas and Chef de Cuisine Ron Oliver bring a wealth of comestible knowledge and accomplishment to the restaurant’s menu, which supports sustainability of local food resources. 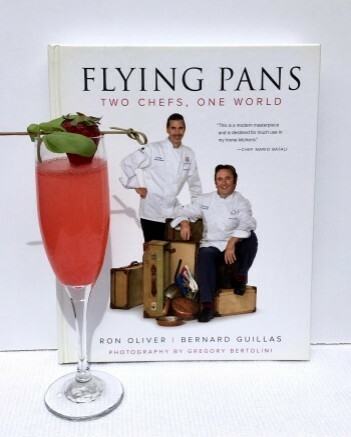 Together, they draw upon their love of food, travel, and people for their cookbook, Flying Pans Two Chefs, One World. The beautifully photographed book takes us along on their global culinary journey, and our senses get to experience their passion for exotic, creative cuisine. The facile recipes are impressive and inspirational. The chefs encourage the reader to prepare the food with their own personal touches and preferences, stressing that the ultimate reward is sharing your results with loved ones. The “Gathering” section of the cookbook refers to the bringing together of friends and family for the prelude to the formal meal. Cultures derive their individual appetizers and libations from their local food sources, customs, and traditions. 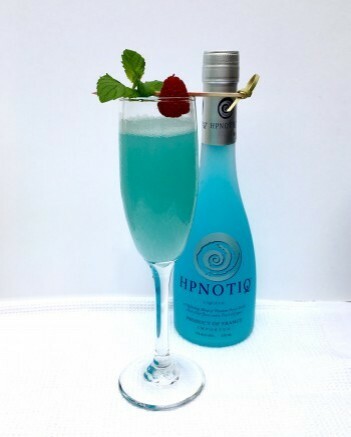 I was drawn to the wine concoctions under “Bubbles.” I was especially intrigued with the beauty of Hypnotic Blues, and the Hynotiq liqueur used in the cocktail. This branded liqueur, born less than two decades ago, was the vision of Raphael Yakoby, a New Yorker who was inspired by the blue color of a perfume he saw at Bloomingdale’s. My take on the gorgeous color is that it lives on the cyan spectrum between aqua and turquoise. Consisting of tropical fruit juices, cognac, and vodka, it is now produced in the Cognac region of France by Heaven Hill Distilleries. Divide Hypnotic liqueur among champagne flutes (2 tablespoons per glass). Fill flutes with champagne. Garnish with raspberry skewer and mint sprig. Another champagne drink that caught my eye is the Strawberry Rose. The book’s magnificent photography by Gregory Bertolini complements the enticing ingredients and the clearly written instructions. Add sliced strawberries, sugar, vodka, and rose water to small mixing bowl. Toss to coat. Cover. Refrigerate six hours. Stir to dissolve sugar. Strain through fine sieve. Reserve strawberries for another use. Add 1 tablespoon strawberry rose syrup to each flute. Fill with champagne. Garnish each with one whole strawberry. Cocktail recipes provided with permission from the Marine Room.